As I put the finishing touches on the first Newsletter of the 2016 Season, I am editing my previously written comments about how spring is almost here. We’ve certainly had a fair share of very mild days recently here in the Chicago area. However a winter storm warning was recently issued and the current 49 degrees will yield to what’s forecast as 4-8 inches of snow overnight and into the morning tomorrow. Nevertheless, the harbor is now ice-free and will likely remain that way. And in only a couple weeks or less, I’ll be giving the order to have the boat rolled out of storage so I can begin my annual, pre-season tradition rituals of waxing the hull and getting it cleaned-up ready for the 2016 Season, my ninth as a Captain. It’s been a mild winter here in the Chicago area for the most part with only a minimal amount of snow (up until now) and no sustained deep-freezes. I have only been able to get out once to snowshoe, after a late-November snowstorm, and have not been able to cross-country ski at all. That could change tomorrow! but I did recently return from a great trip to Utah however, where I skied four different mountains; Snowbasin, Powder Mountain, Alta, and Snowbird. Between the two separate ski areas, I drove down to Zion National Park and did a hike in the morning called Angel’s Landing then hiked the approach to what’s called ‘The Subway’ in the afternoon. The Angel’s Landing hike was really incredible; a moderate, 5-mile roundtrip hike with a 1500-foot elevation gain but the last half-mile to the end and back again (so a mile in total), is traversed on a narrow spine-like, ridge line. It’s a 1000-1500 foot plunge to the valley floor on either side, with the last half-mile being another 400 feet or so up. I dropped my pack and poles at the beginning of the final ascent and discussed what lay ahead with a few strangers that were unsure whether they wanted to proceed or not. It was a bit icy but I had spikes strapped on my boots and there are chain handholds for stretches of it. The strangers did not have strapped-traction for their boots and they decided not make the attempt. I pushed ahead and made it to the end. And back again. And could not help think of the six documented deaths that have occurred here since 2004 (more undocumented deaths are rumored). Still, many people complete this hike mostly everyday but it is treacherous. I joke that the Angel’s Landing hike was probably the most memorable part of my ski trip! But the skiing was very good too. I skied four mountains I’ve never been on and each were quite different from each other. I also stayed in very different kinds of lodges than I have experienced on other trips. Now that I am back and hoping for spring to come early, I’m working every day, getting everything ready for the season to start. This includes of taking calls and emails and filling up the book for the upcoming season. Tying lots of flies that I sell and of course we’ll use in the spring for coho. Taking inventory of what’s need for engine maintenance as well as fishing gear and tackle and ordering it all. And tending to existing tackle and gear; making modifications to some things and cleaning up and getting the rest of it organized and ready. And also, believe it or not, studying. There’s lots of (mostly) magazine and article literature out there which discusses personal tips, techniques and ideas documented by other captains and fishermen. All of this taken together with what I know and do already, can sometimes be formulated into new or modified strategies for me to attempt in the future which I may have not thought of. I’m always seeking different perspectives and ideas for me to improve upon and I always try to keep an open mind in order to best ensure against considerations I may not have made. All of these things to me are off and pre-season rituals of sorts and I have lots of fun with and really enjoy. A couple of refreshers to consider again if you have not booked yet but are considering coming this season. In April, sometimes we have coho salmon and sometimes we do not. Sometimes we have some but not a lot. Sometimes we have them, we catch many of them, and then we wait for a new batch to arrive. However, in the total absence of coho or lack of large numbers, we usually have a good brown and lake trout fishery in shallow water, along the bluffs, a little south of the harbor. These are solid fish, generally in the 6-12lb range on average and they fight hard. A lot harder than the lake trout we catch in the summer and fall that are 100-200 feet down. It’s the same fish but it’s remarkable how different they behave in ice-cold, shallow water. This usually last a few weeks depending on a few other factors and we’ve had many trips where we come close to or limit on these fish. Plus, they are excellent smoked. 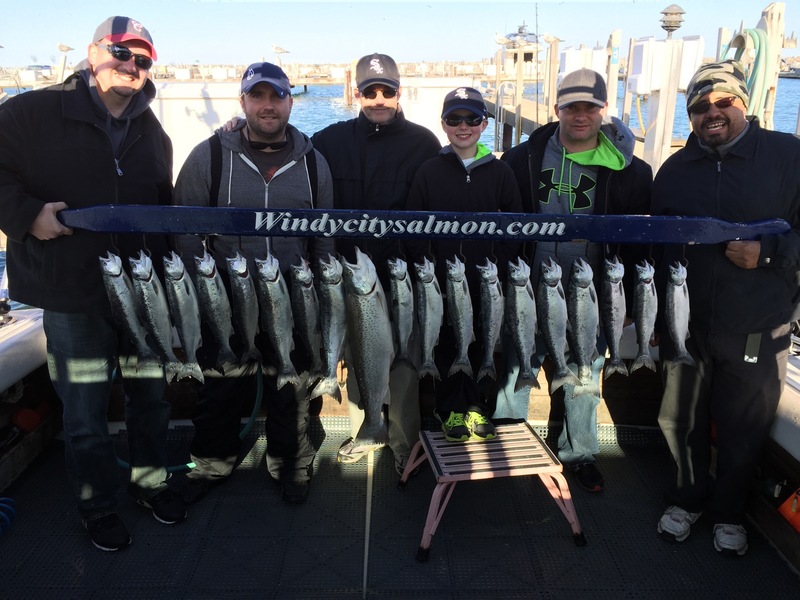 Then at some point if we haven’t had many coho, usually in late-April or early-May, the large schools of coho arrive – often overnight – and we’ll be loading up with mostly coho salmon throughout May. Many people feel that coho salmon are the best tasting salmon out there. 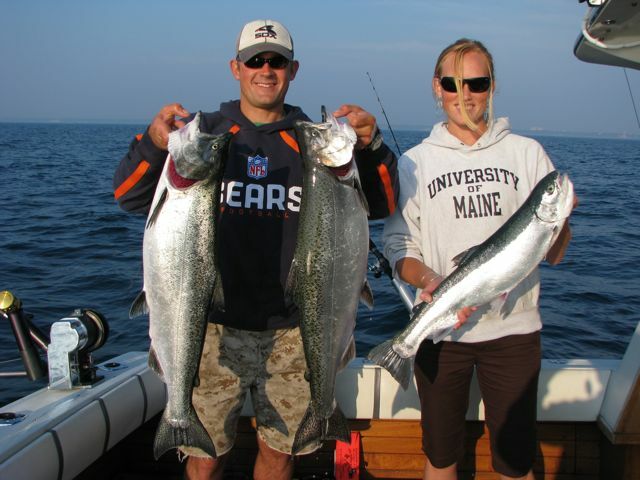 The large catches of coho can last well into June and sometimes they don’t. Sometimes we have pockets of coho that we can locate and fish them for a week or a few days. 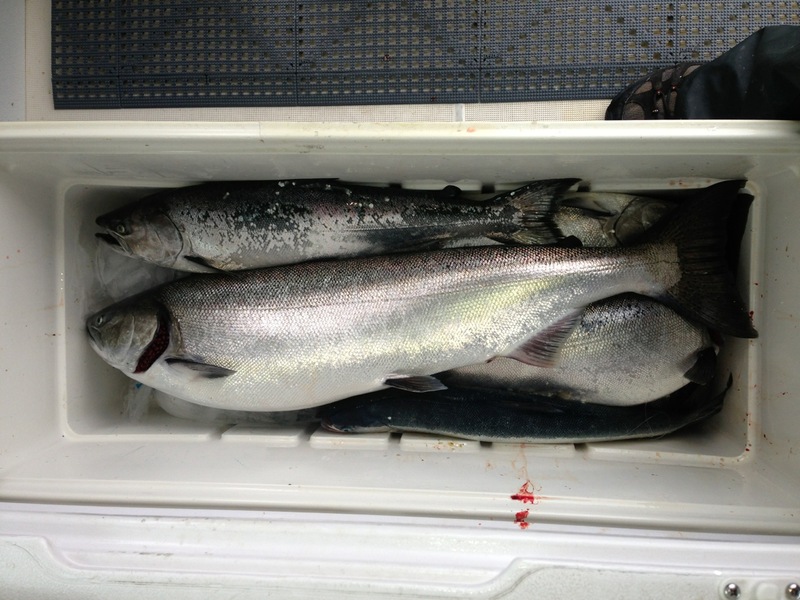 We also see a fair number of larger king salmon start to mix in with our catches in late-May and throughout June. Sometimes big schools of steelhead make their way into our waters along with additional lake trout trout. In these regards also, you should not delay much longer to reserve a spring date. Already, nearly all spots this April, May and June are already booked. There is weekday availability but that is getting thinner by the day and weekends in the summer are also getting booked.Generally speaking, morning fishing is usually better than the afternoon but that tends to matter the least in April and May. It begins to make a difference, starting in late-May, with good catches in the afternoon possible, well into June. By July however, I am running mostly morning charters for the remainder of the season, as a courtesy to my customers as well as myself. 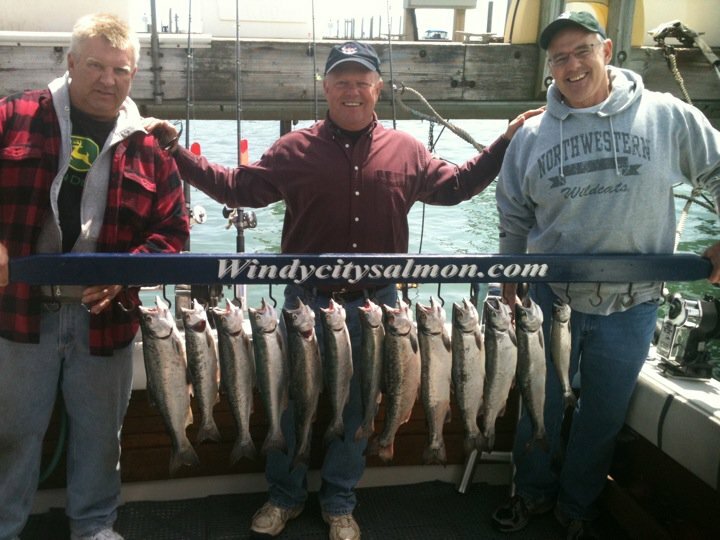 I recommend 5-hour charters in April and May. However sometimes people like the insurance of a 6-hour in the spring. From June onward, I recommend the 6 and 8-hour charters.So it’s crunch time now in many ways and this off-season has gone by quickly. I should be on the water in about a month or less. We’ll have a pair of new coolers on board this season with custom-made, matching cushions on top each. We’ll try a few new fishing presentations that I have been researching. And of course employ and fine-tune many of my own, successful approaches and techniques that I have developed in past seasons. I can’t wait to get going! I attached a few professional photos of Angel’s Landing that were taken at better angles than I was able to find when on the hike. In the one photo, you can see the people at the top, giving a perspective of it’s height, incline, and narrowness on the final, half-mile approach. And when I hiked, there was considerable ice and snow, of course adding a considerable degree of extra difficulty when considering the treacherous circumstances. I’ll close the letter here and of course, as always, thanks for taking the time to read. I hope everyone enjoys reading my Newsletters as much as I enjoy writing them. PS, if you have not already, follow along on the Windycitysalmon Facebook page on the link below. I don’t post much in the offseason but I do on a near-daily basis when the season begins.